This King was wont to say, the true glory of princes consisteth in advancing God's glory, in the maintenance of true religion and the Church's good. You may wonder why this XVII century British monarch happens to be the only saint canonized and remembered in the Church of England. There is a short explanation to this, in fact, as Bishop Creighton of London in 1895 observed: "Had Charles been willing to abandon the Church and give up episcopacy, he might have saved his throne and his life. But on this point he stood firm; for this he died and, by dying, saved it for the future." This is pretty impressive, isn't it? If we can call ourselves to be part of one, holy, Catholic and apostolic church today is due to the martyrdom of King Charles, yes indeed a Martyr and a King. Under his monarchy England oversaw a phase of restoration for both great cathedrals and small churches, with the commission of works of art (something unheard of since the kingdom of Queen Elizabeth I), he both founded charities and promoted the improvement in the liturgy of Anglicanism and he tried to restore the episcopacy in Scotland, through the adoption of a Scottish prayer book, with the approval of Archbishop William Laud. His reign was a brief Golden Age for Anglicanism and also for spiritual and devotional writings of the so-called Caroline Divines which we still appreciate today. His was not a mere passion for aesthetics, but a real sacrifice made for his belief in the Apostolic Church and for the continual presence of Christ at the table of the churches of his kingdom. He maintained his strong belief until his death, his final words were: "I am the martyr of the people. I have a good cause and a gracious God on my side." Unfortunately many still seem to get stuck with the old concept of King Charles I willing to become an absolute monarch and feed the common speculations about who was in fact a fair King who died for his country. Unfortunately, I believe the story is much more complicated and we must see each action and events in the light of their times. It is indeed true as many answers state that England had a long parliamentary tradition, but no monarch before Charles had ever witnessed such a time of political and religious unrest and leaving religion and the King’s and Parliament’s actual intentions and beliefs out, the actual cause of the King’s murder, is extremely ludicrous. Before 1534, England had long been Roman Catholic, after the Reformation there was still unrest between Anglicans and Roman Catholics, but the Church of England managed to incorporate the Reformation together with the Church’s Catholic heritage quite wholly, under Charles I the Church had become more defined in a High Church faction and a Low Church faction, more Catholic-minded and more Protestant-minded, however it was also a time of extremism and operating under that context never happened before, under any monarch. At the time the Puritans, the most extremist and bigot faction of the Church of England were growing steadily and the King did foresee that having such people in power could have led to catastrophic consequences on individual freedom, as it later very well showed during the Civil War and Oliver Cromwell’s tyrannical rule of the Commonwealth of England. Therefore, King Charles I, a high churchman himself, believing in a balance between the Church’s Catholic and Reformed tradition, appointed William Laud as Archbishop of Canterbury, who reinforced within the Church of England a more balanced policy which truly reflected the via media ethos of Anglicanism. Scripture was equally important to ritual; altars and liturgy were embellished, churches were re-decorated, and theology was made more comprehensive through the Caroline Divines, a group of high church theologians, but especially and most importantly both the King and the Bishops, preached in favour of the importance of the historical episcopacy as opposed to the Puritan’s policy, which was Calvinist and which intended to impose a theocracy on England, as it later occurred, and also on the divine right of kings, which the British Crown still supports in a diluted version. Clearly, this was good not enough for the Puritans, in fact Archbishop Laud was later executed too. 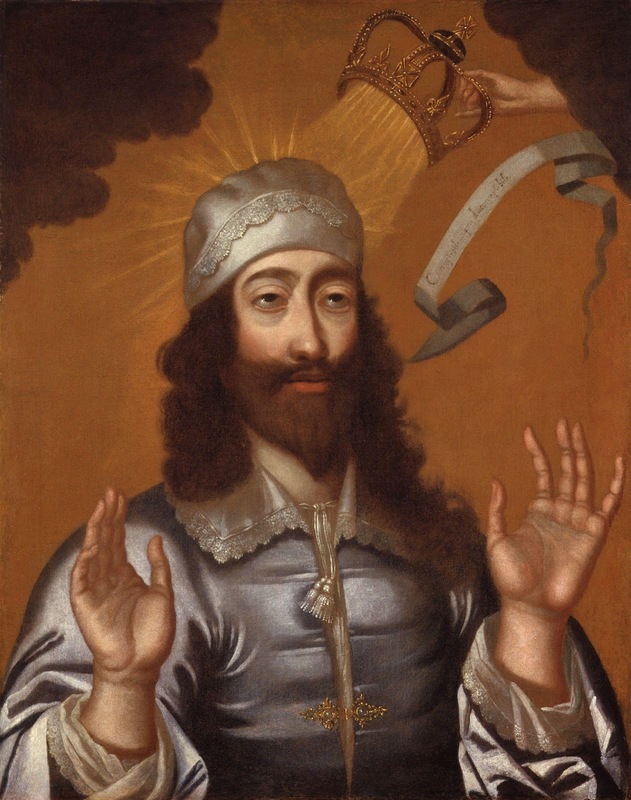 This religious unrest caused both sides, the King and members of Parliament, to arm, Parliament was conspiring against the King, as we know Charles was the first King to march into Parliament to arrest several members himself. This never happened before in the history of England, but it was probably also the only time in English history in which Parliament was completely “un-democratic”, it was simply a mock of a Parliament. The Civil War started, after two years King Charles was captured and he underwent a mock trial, he was deemed to have been willing to put his interests before the nation’s (whereas in fact he believed he was doing the opposite and incidentally it also was), he was sentenced for various crimes which Parliament also committed and finally he was also sentenced to death - he was asked to plead but didn’t, because he truly believed he was doing the best for the country. On 30 January 1649, the King was beheaded by the Banqueting House in London, his last words were: For the people. And truly I desire their Liberty and Freedom as much as any Body whomsoever. But I must tell you, That their Liberty and Freedom, consists in having of Government; those Laws, by which their Life and their goods may be most their own. It is not for having share in government (Sir) that is nothing pertaining to them. A subject and a sovereign are clean different things, and therefore until they do that, I mean, that you do put the people in that liberty as I say, certainly they will never enjoy themselves. Sirs, It was for this that now I Am come here. If I would have given way to an Arbitrary way, for to have all Laws changed according to the power of the Sword, I needed not to have come here; and therefore, I tell you, (and I pray God it be not laid to your charge) That I Am the Martyr of the People. I go from a corruptible to an incorruptible Crown, where no disturbance can be, no disturbance in the World. Following his death, England entered a time of religious turmoil called the Commonwealth of England, a 10 years brutal theocracy and tyrannical dictatorship at the hands of Oliver Cromwell, weary of their mistakes the people of England restored the monarchy in 1660, the King being Charles I’s son: Charles II. Charles I was the only saint to be canonised by the Church of England, right during the 1660 Restoration, he is seen as the protector of the Church who fought against theocracy and tyranny, a Society of Saint Charles King and Martyr was founded in 1894 to remember him and each January there is a memorial service at the Banqueting House in London to remember the least understood monarch of all time. I truly believe that as Anglicans we must be thankful for his sacrifice - therefore I truly hope that today your prayers will be devoted to this our great Saint and Martyr.